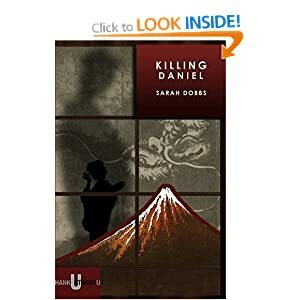 Goggle will be publishing Sarah Dobbs later this year. I received news that my story was the first of the finalists in the Flybe and Stream Publishing Short Story Competition. That means that if you’re on a flight (on Flybe) some of my words shall accompany you on your journey. I quite like that idea. What else, I won a scholarship from the SLS competition. I only wish I could afford the rest – writing on safari. How super cool. Oh, well! The build up to Killing Daniel’s release is starting to kill me! I just want the novel to be out there and read, and to get an idea of the reaction. Crossing of fingers. Another academic year ends shortly. There is writing to be done (and marking) but mostly, hopefully, writing. I’m hard at work on a new novel called Project Violet. Her Sister’s Killer (the second book) is currently out with publishers. (More crossing of fingers). Some days I feel like I don’t accomplish much. So much of a writer’s life is spent waiting (and marking) and waiting and being deterred from writing by the still-constant sense of rejection. Nobody tells you that, really. That even when you’re published, the rejection continues and that sometimes the batches of rejection seem to be nodding knowingly at you, like, come on Sarah, isn’t it time to give it up. I’m also the final writer at Goggle Publishing for 2012. Can’t wait to see the cover, as the ones that have gone before are extremely slick and pertinent to the stories. I had my own little reunion with Salford Uni today. Went for a wander with my remaining marking to the little park in its belly. Salford isn’t always that pretty, but it’s a gorgeous day here today. I thought about the importance of the place for me. I did so much here, failed, tried again, did a bit better, tried harder, and then harder. And then the MA and that evil PhD (you’ll never be the same again) and then sitting in the park where I was once an English student, marking work. I’m thinking, I remember dying my hair black that time and knocking everything over at Blackwells bookshop which was seriously bad because I was seriously shy and the guy had been quite cute. (Flaming blush.) The Blackwells is closed now. Geographically, for about half the week at least, I haven’t moved. But in some other location that you can’t measure, it’s been a weird and massive ruddy jump. So when I’d finished marking, I walked up through the campus, past the art gallery which has now been revived and turned back, just to get an over shoulder shot of that ugly cranberry red and grey sign (it was nicer before): Salford University. Cue stupid cheesy grin. I owe this place a lot. It was literally the start of a new life and a new way of thinking. Sometimes I forget that all that penury and fumbling and studying and getting to grips with stuff has paid off. Do we give universities enough credit for what they do? For people, and not just CVs. Do I sound like Carrie chuffing Bradshaw? Oh well.